A recent spike in the number of attacks on African nationals in India has triggered a debate on racial discrimination in the country. Just hours after a Nigerian student was beaten up in Hyderabad, a number of African nationals were reportedly attacked on the night of 26 May in Chattarpur's Rajpur Khurd village. A mob reportedly carried out four attacks on African nationals. The victims - believed to number between seven and 12, were reportedly attacked with sticks, iron rods and cricket bats. The victims have alleged that racial slurs were hurled at them before they were physically attacked. Four separate cases have been registered against the attackers. Two people were arrested on 29 May. While the victims described these attacks as racist, the police described the attacks as "minor scuffles" and "isolated incidents" caused by "their loud music and public drinking". The Indian Express quoted residents of the village as saying that African nationals residing in the area were a menace. The police however, have dismissed all allegations that the attacks were racially-motivated. On 27 May 2016, Bamilola Kazeema, a 26-year-old Nigerian student at Nizam College, alleged that he had been attacked with an iron rod after a dispute over parking. The man who attacked Kazeema, a third-year student at Nizam College, was taken into custody. Police ruled out any racial motive in the incident. On 20 May 2016, Masonda Kitanda Olivier, a 23-year-old Congolese national, was allegedly beaten to death by a group of men in south Delhi's Vasant Kunj area. Olivier reportedly succumbed to his injuries after he got into an altercation with three men over an autorickshaw. One man has been arrested in the case. On 31 January 2016, a mob attacked four Tanzanian students in Bengaluru's Hessarghatta area when they stopped to ask about an accident - where a Sudanese man had run over and killed a woman. The mob had set the Sudanese man's car on fire and had beaten him up - but he managed to escape. The mob also beat up the Tanzanian students and stripped the female student before setting their car on fire. The female student who was harassed complained that she was refused help from passersby, as well as police and hospital authorities. The Rajpura Khurd attack came a day after the African Heads of Mission decided to boycott this year's Africa Day celebrations - scheduled for 25 May - to protest Olivier's death. "The Group of African Heads of Mission have met and deliberated extensively on this latest incidence in the series of attacks to which members of the African community have been subjected to in the last several years," Eritrean Ambassador Alem Tsehage Woldemariam, who is also dean of the Group of African Heads of Mission said in a statement. 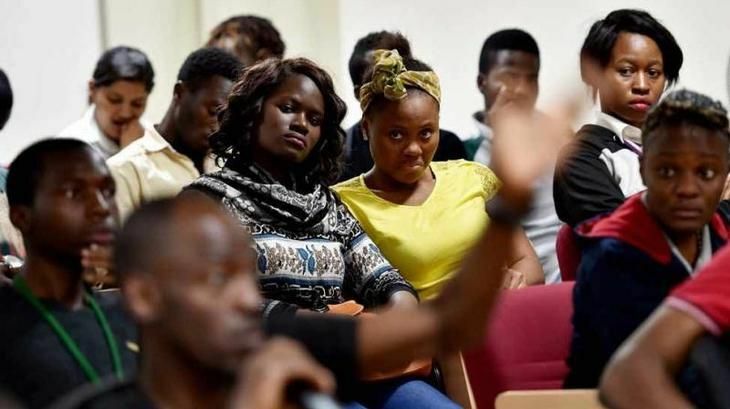 "They strongly condemn the brutal killing of this African and calls on the Indian government to take concrete steps to guarantee the safety and security of Africans in India," the statement said. In all four cases, Minister of External Affairs, Sushma Swaraj was quick to assure strict action against those guilty. "I would like to assure African students in India that this [is] an unfortunate and painful incident involving local goons," Minister of External Affairs Sushma Swaraj tweeted after news of the attack on Kazeem in Hyderabad broke. In the wake of the 26 May attacks, she directed Minister of State General VK Singh and MEA Secretary Amar Sinha to meet the victims, who plan to hold a protest in Jantar Mantar this week. "I have spoken to Shri Raj Nath Singh ji and Lt Governor Delhi reg attack on African nationals in South Delhi yesterday. They assured me that the culprits will be arrested soon and sensitisation campaign will be launched in areas where African nationals reside," she tweeted on 29 May.